Meadowcroft requires that two adults (admitted free) accompany each group of 20 students. Additional adults are welcome, but will be charged the regular program fee. Chaperones must accompany students at all times. Please fill out an Education Program Request Form with your information to request a program at Meadowcroft. Explore the discovery and excavation of Meadowcroft Rockshelter, a National Historic Landmark, in this newly designed field trip experience. Interactive stations provide students with hands-on and inquiry-based opportunities for uncovering the secrets of the “First Peoples” and the multidisciplinary approach of the experts who study the archaeological site. Investigate how the geography and ecology of the Cross Creek watershed impacted the ability of prehistoric people to camp here, explore the geologic forces that created the Rockshelter and its stratigraphy, examine the archaeological site, and analyze educational artifacts to understand how archaeologists interpret a cultural assemblage. Travel 400 years into the past to explore a re-created Eastern Woodland Indian Village at Meadowcroft. The palisaded settlement includes wigwams, a representative native garden plot, hunting camp, and other educational archaeological features common to Monongahela Indian sites. This program emphasizes the forest-centered lifestyle of pre-contact American Indians in the Upper Ohio Valley. Students have an opportunity to try using an atlatl, a pre-historic spear thrower, and learn about the complex relationship between nature and man. Visit Meadowcroft’s 19th century village to learn about how early industrialization affected rural life in the upper Ohio Valley. Students will visit historic log houses and learn what life was like before modern conveniences. The topics include textile manufacture, pre-electric lighting, and historical games. In addition to visiting the log homes, students will experience a simulated lesson in a one-room schoolhouse and get to witness a blacksmith at work in his forge. 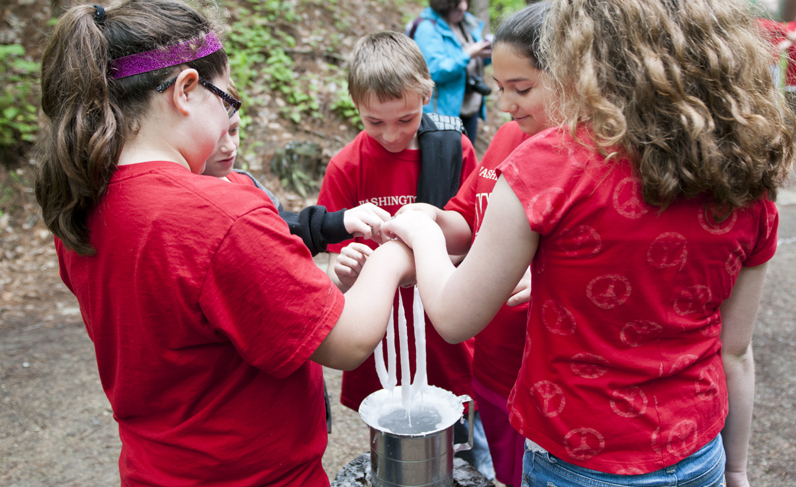 Add on a guided tour of the Meadowcroft Rockshelter to any of our other programs. Discover why prehistoric people picked this site and how they lived here over the last 19,000 years as you explore the archaeological excavation that uncovered this National Historic Landmark.